Last week the redPepper digital and content teams visited the B2B Marketing Expo at the ExCel centre in London. The day was jam-packed with marketing seminars and masterclasses from a range of industry professionals and, let’s not forget, plenty of freebies! Amidst the free pens, flyers and branded cupcakes (they know how to win us over), we learnt some really useful marketing insights to take forward in our work over the upcoming months. For me, the day began with an insightful and thought-provoking talk by Sandra Iakovleva, from stock imagery website DepositPhotos. The 30-minute seminar ran through the nine visual trends featured on their innovative landing page, offering examples and suggestions on how you might implement them into your own content strategy. Despite criticisms that it had induced headaches for some users, my opinion is that the page runs through the nine trends in a very engaging and creative way, much like Sandra’s seminar. From the talk, I learnt a lot about the different trends that we can expect to emerge across 2019. These range from the era of personalisation to nostalgic flashbacks and embracing art history, all the way to 3D design transitions. One of the most interesting visual trends mentioned was that of the first global aesthetic. This section of the talk probed the question as to why cafés all over the world are beginning to look the same. 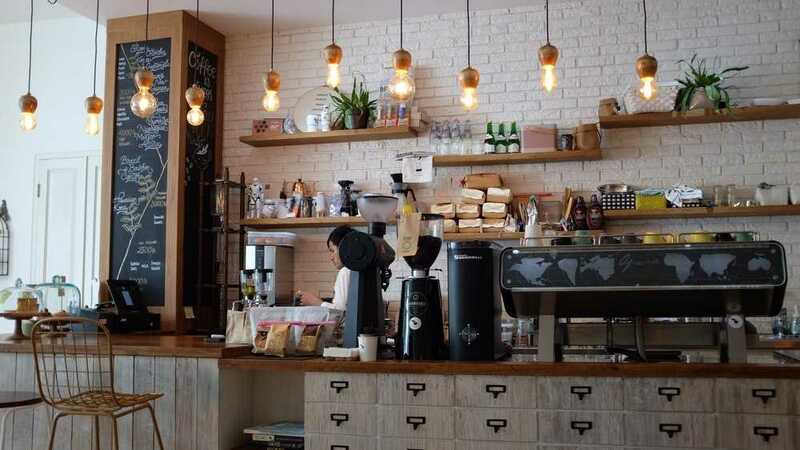 Think minimalist, exposed lightbulbs, perfectly formed coffee art and subway tiles. It’s true that this style is emerging across interior design spaces everywhere, but why? The answer is Instagram. In short, social media is increasing the demand for this type of visual aesthetic and therefore is shaping the world around us, one café at a time! Café’s around the world are starting to adopt the same styles. This could be due to the growing importance of social media, especially Instagram. For Pete, the day began at one of the larger keynote talks, in a discussion from Jack Dyson about all things content marketing. To begin with, Jack focused on the importance of considering your customer within the creation of your content. This occurs by identifying the problem that your customer faces and how you can angle your content to target the solution to this problem. You have just a matter of seconds to compel a customer to buy, so it’s important to make your perspective as unique and current as possible. Jack then moved on to discuss a later stage of content creation, the editing process. He highlights the importance of implementing a rigorous editorial process that works for your business. In general, this should involve a series of peer reviews and revisions which culminates in an editing and proof-reading stage. By the end, you’ll have a great piece of copy with few, if any, errors. To end, Jack moved onto the final stage of content creation, the idea of reusing content again and again. Recycling old content is a great way to discuss old topics in a current way. Jack stressed the importance of identifying multiple uses and applications for each piece of content. He also noted that when a content opportunity arises, you should attempt to produce multiple assets from it whether this is a blog, a video or an infographic, to name a few. By doing so, you hit a wider audience and your message is delivered to as many people as possible. Our second seminar of the day was by Daniel Leigh Smith from digital marketing agency Fireworx. The talk took a more strategic stance, which was a nice change after our content-focused morning. Predominantly, the talk focused on strengthening your business’s proposition and what you can offer your customers. Daniel noted that you should focus on defining your proposition prior to creating a strategy because it fundamentally underpins it. In defining your proposition, don’t be afraid to be disruptive, the key is creating a meaningful difference from your competitors. Daniel continued with this idea through his “-est” analogy. In this, he stated that in business you should always strive to be an “-est”, meaning you’re the biggest, fastest, strongest, easiest, and so on. If you’re not one of these, your customers will opt for whoever is. This idea reinforces that you need to stand out from your competition and, more importantly, you need to work out what it is you offer that your competitors don’t. By identifying one or two key differences between your solution and your competitor’s, you offer the highest possible amount of value to your target customer. Meanwhile, David attended William Villalobos’ seminar discussing the millennial generation and the approach required to market your product or business to them. The talk was centred around the phrase “millennials don’t care about your campaigns”, recognising the aversion that the generation may have towards certain styles of advertising. William referenced the short attention spans of the generation and, as a result, their requirement for immediate information. For a brand looking to target millennials or generation Z, it’s important to make them aware of the problem that you can solve for them instantly. The seminar also recommended making your brand clear from the outset of the ad. In this instance, a millennial is more likely to pay attention to your campaign. However, as well as gaining information quickly, millennials prefer to get to grips with your product or service. William stated that millennials require as much information about you as possible so that they can make an informed decision about whether or not they want or need your brand. Just before a lunchtime burger pitstop, I attended a talk by Simon Harmer from agency Marmalade on Toast. In a seminar about creating an engaging brand, Simon did just that, with thoroughly entertaining anecdotes and a visually striking slideshow. With insights, hints and tips interwoven throughout, Simon explored step-by-step what a brand is, how you get one and why you need one. Throughout the talk Simon was keen to reiterate that a brand is more than just a logo, it’s the entire identity of your business and can be anything from visuals and voice, to smell, sound, and touch! I found the reasons Simon listed for why you might need a brand particularly interesting, or why having a strong brand is important. A strong brand can ensure that you’re connected to the right audience, give you a sense of purpose as a business and ensure differentiation from your competitors. The final stop of our day was at a digital marketing masterclass led by marketing agency Distract. The masterclass included some thought-provoking insights which sparked much conversation between the team about how we might implement these within our own work. Speaker Tom Jacobs focused on the idea of staying ahead of the digital game. He claimed that in time, any new innovative idea is caught onto, and suddenly it isn’t so new and innovative anymore. From here he noted the importance of getting “cleverer” with your marketing by which you find new ways to be relevant. This was a phenomenon that he called being “hyper-relevant”. One particularly poignant section of the talk was where Tom highlighted the shift in content produced by brands across social media in the past few months. He noted the difference in the way that customers interact with a brand on social media, with users longing for sharable and saveable content. As a social media strategy, this idea is genius, particularly for e-commerce businesses. What this means is that a customer actually gains something from following or being connected with your brand online. It’s putting the social into social media as the interaction becomes a two-way exchange. You offer saveable content, they share it. Below is a great example of this from Tesco, the customer gains from the recipe and Tesco gains as the customer buys the associated ingredients. For more hints, tips and insights into the marketing industry, make sure you’re following us on Twitter, Facebook and LinkedIn! We’ll be sharing some more in-depth thoughts about our visit to the B2B Marketing Expo over the next few weeks, so stay tuned.